1. 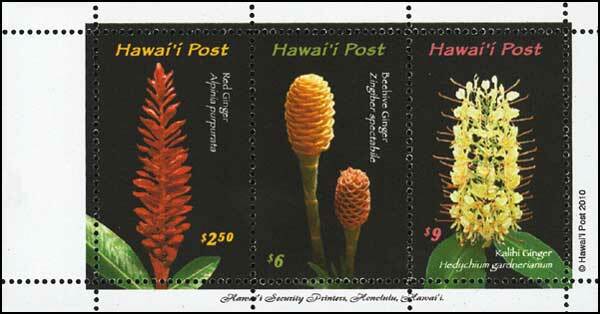 The first booklet was issued on June 13 2000 to celebrate the Centenary of the last day of use of Hawai'i postage stamps on June 13 1900. The Booklet consists of 3 panes containing 2 x $1, 2 x $3 and 2 x $5 stamps. Each booklet pane of 2 stamps has a white margin all around. "© 2000 Hawai'i Post" is printed vertically on the lower right side margin & Hawai'i Security Printers, Honolulu, Hawai'i. is printed on the bottom margin of each pane. The booklet cover is of parchment type card stock and is stapled twice at the left side. The cover has a black and white photo of Waikiki taken around 1900 showing two native Hawaiians and their canoes with Diamond Head in the background. The back cover explains Hawai'i Post's postage rates. Booklet panes (unstapled) without the booklet cover can be ordered - both mint, used and on First Day Covers. NOTE: This booklet is off-sale and no longer available. 2. The second booklet was issued on October 16th 2000 to celebrate the 125th anniversary of the birth of Princess Ka'iulani, Heiress Apparent to the Kingdom of Hawai'i. The Booklet consists of 3 panes containing 2 x $2, 2 x $3 and 2 x $5 stamps. Each booklet pane of 2 stamps has a white margin all around. "© 2000 Hawai'i Post" is printed vertically on the lower right side margin & Hawai'i Security Printers, Honolulu, Hawai'i. is printed on the bottom margin of each pane. The booklet cover is of white card stock with a glossy finish and is stapled twice at the left side. The cover shows a pastel portrait of Princess Ka'iulani by local artist Wayne Takazono. The back cover explains Hawai'i Post's postage rates. 3. 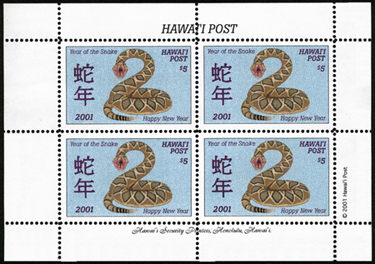 The third booklet was issued on January 24th 2001, the first day of the Chinese New Year - the Year of the Snake. The booklet consists of the $5 stamps in a block of 4 with a white margin all around. "Hawai'i Post" is printed on the top margin. 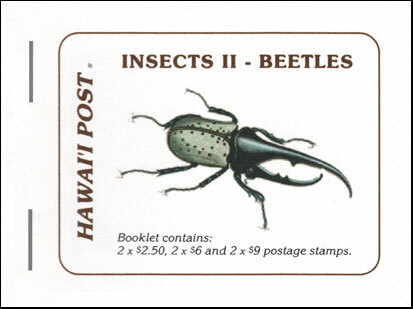 "© 2001 Hawai'i Post" is printed vertically on the lower right side margin & Hawai'i Security Printers, Honolulu, Hawai'i. is printed on the bottom margin of each pane. The booklet cover is red with text in metallic gold ink. The back cover explains Hawai'i Post's postage rates. 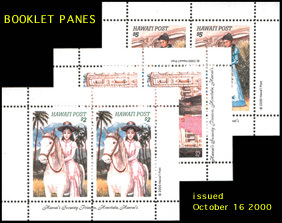 Booklet panes without the booklet cover can be ordered - both mint, used and on First Day Covers. 4. 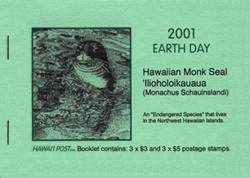 The fourth booklet was issued on April 22nd 2001 to celebrate Earth Day. The Booklet consisting of 2 panes containing 3 x $3 and 3 x $5 stamps. Each pane consists of 3 stamps and a label and has a white margin all around. "© 2001 Hawai'i Post" is printed vertically on the lower right side margin & Hawai'i Security Printers, Honolulu, Hawai'i. is printed on the bottom margin of each pane. 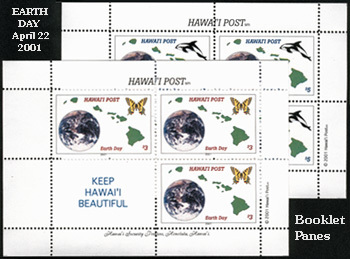 The label on each booklet pane reads "Keep Hawai'i Beautiful". The booklet cover is of green card stock and is stapled twice at the left side. The cover has a black and white photo of a Hawaiian Monk Seal. Click here to order the booklet and booklet panes. 5. 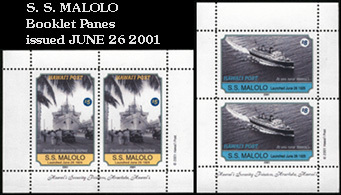 The fifth booklet was issued on June 26th 2001 to celebrate the 75th anniversary of the launching of the luxury passenger ship "S.S. Malolo", pride of the Matson Line. The Booklet consists of 2 panes containing 2 x $5 and 2 x $8 stamps. Each booklet pane consists of 2 stamps and has a white margin all around. "© 2001 Hawai'i Post" is printed vertically on the lower right side margin & Hawai'i Security Printers, Honolulu, Hawai'i. is printed on the bottom margin of each pane. The booklet cover is of blue card stock and is stapled twice at the left side. 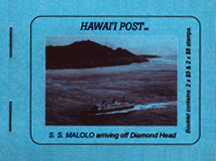 The cover has a black and white photo of the S. S. Malolo arriving off Diamond Head. The back cover explains Hawai'i Post's postage rates. 6. The sixth booklet was issued on September 4th 2001. Hawaiian Orchids. The Booklet consists of 3 panes containing 2 x $2, 2 x $5 and 2 x $8 stamps. Each booklet pane consists of 2 stamps and has a white margin all around. 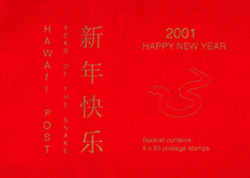 "© 2001 Hawai'i Post" is printed vertically on the lower right side margin & Hawai'i Security Printers, Honolulu, Hawai'i. is printed on the bottom margin of each pane. The booklet cover is of orchid-colored card stock and is stapled twice at the left side. 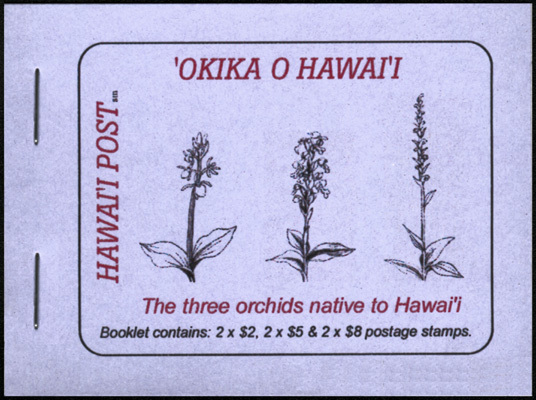 The cover has drawings of the 3 Hawaiian orchids. The back cover explains Hawai'i Post's postage rates. 7. The seventh booklet was issued on February 12th 2002. Year of the Horse. Pa'u Riders. The Booklet consists of 2 panes containing 2 x $5 and 2 x $8 stamps. Each booklet pane consists of 2 stamps and has a white margin all around. 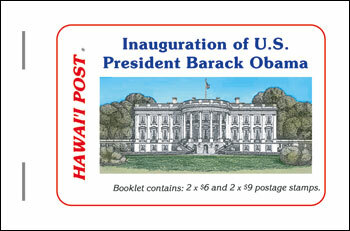 "© 2002 Hawai'i Post" is printed vertically on the lower right side margin & Hawai'i Security Printers, Honolulu, Hawai'i. is printed on the bottom margin of each pane. The booklet cover is of white card stock and is stapled twice at the left side. 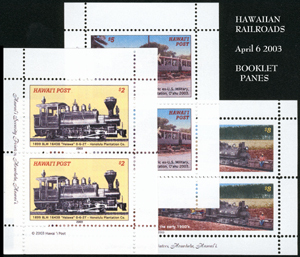 The cover has a color photo of the stamps enclosed. The back cover explains Hawai'i Post's postage rates. 8. The eighth booklet was issued on April 16th 2002. Hawaiian Birds. 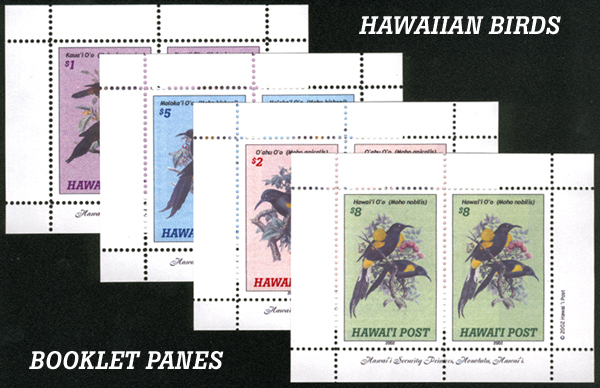 The Booklet consists of 4 panes containing 2 x $1, 2 x $2, 2 x $5 and 2 x $8 stamps. Each booklet pane consists of 2 stamps and has a white margin all around. 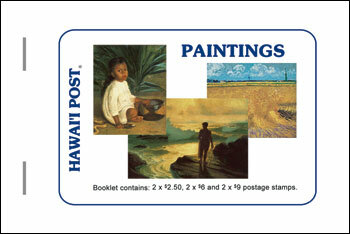 "© 2002 Hawai'i Post" is printed vertically on the lower right side margin & Hawai'i Security Printers, Honolulu, Hawai'i. is printed on the bottom margin of each pane. The booklet cover is of white card stock and is stapled twice at the left side. 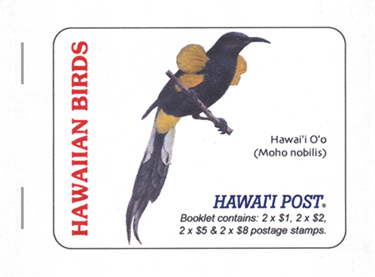 The cover has a color image of the male Hawai'i O'o (Moho nobilis). The back cover explains Hawai'i Post's postage rates. 9. The ninth booklet was issued on August 24th 2002. Surfing in Hawai'i. 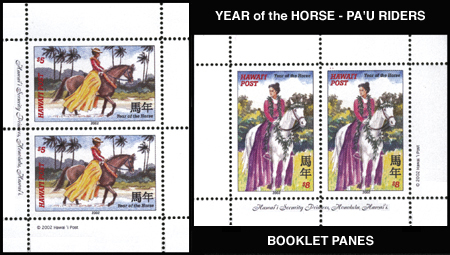 The Booklet consists of 3 panes containing 2 x $3, 2 x $5 and 2 x $8 stamps. Each booklet pane consists of 2 stamps and has a white margin all around. "© 2002 Hawai'i Post" is printed vertically on the lower right side margin & Hawai'i Security Printers, Honolulu, Hawai'i. is printed on the bottom margin of each pane. The booklet cover is of white card stock and is stapled twice at the left side. 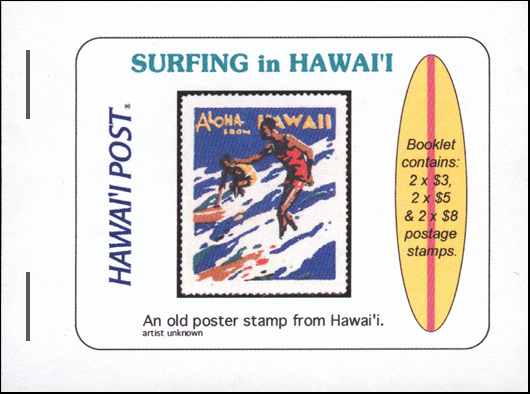 The cover shows an old poster stamp depicting two surfers riding a wave. The back cover explains Hawai'i Post's postage rates. 10. The tenth booklet was issued on October 21st 2002. Hawaiian Lighthouses. The Booklet consists of 3 panes containing 2 x $2, 2 x $5 and 2 x $8 stamps. Each booklet pane consists of 2 stamps and has a white margin all around. "© 2002 Hawai'i Post" is printed vertically on the lower right side margin & Hawai'i Security Printers, Honolulu, Hawai'i. is printed on the bottom margin of each pane. The booklet cover is of white card stock and is stapled twice at the left side. The cover has a color photo of Makapu'u Lighthouse at night. The back cover explains Hawai'i Post's postage rates. 11. The eleventh booklet was issued on April 6th 2003. Hawaiian Railroads. The Booklet consists of 3 panes containing 2 x $2, 2 x $5 and 2 x $8 stamps. Each booklet pane consists of 2 stamps and has a white margin all around. 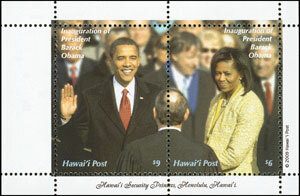 "© 2003 Hawai'i Post" is printed vertically on the lower right side margin & Hawai'i Security Printers, Honolulu, Hawai'i. is printed on the bottom margin of each pane. The booklet cover is of white card stock and is stapled twice at the left side. 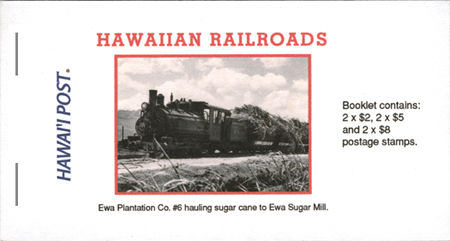 The cover has a black-and-white photo of the Ewa Plantation #6 locomotive hauling sugar cane to the Ewa Sugar Mill. The back cover explains Hawai'i Post's postage rates. 12. The twelfth booklet was issued on July 29th 2003. 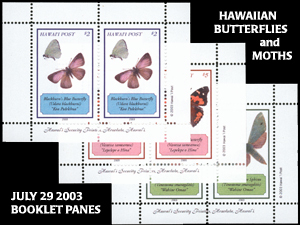 Hawaiian Butterflies & Moths. The booklet cover is of white card stock and is stapled twice at the left side. 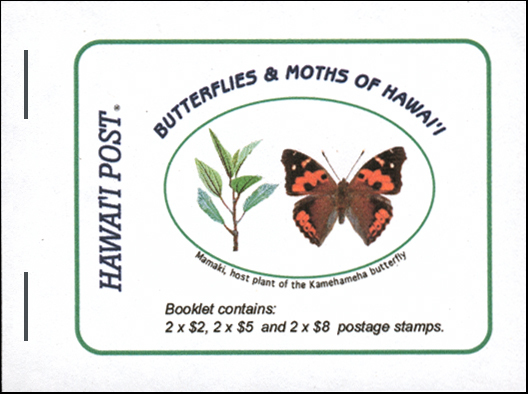 The cover has the Mamaki, host plant of the Kamehameha Butterfly (also shown). The back cover explains Hawai'i Post's postage rates. 13. 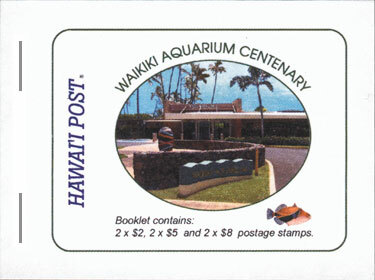 The thirteenth booklet was issued on March 19th 2004 depicting Hawaiian fish and to celebrate the Centenary of the Waikiki Aquarium. The Booklet consists of 3 panes containing 2 x $2, 2 x $5 and 2 x $8 stamps. Each booklet pane consists of 2 stamps and has a white margin all around. "© 2004 Hawai'i Post" is printed vertically on the lower right side margin & Hawai'i Security Printers, Honolulu, Hawai'i. is printed on the bottom margin of each pane. The booklet cover is of white card stock and is stapled twice at the left side. 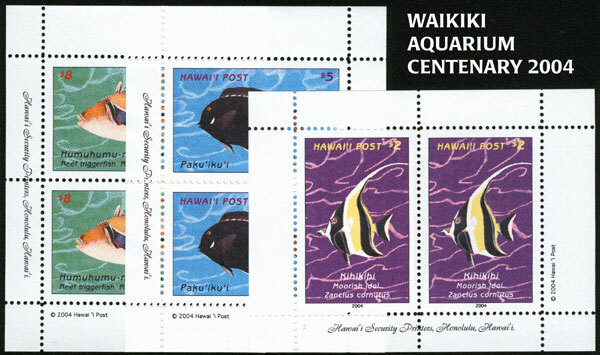 The cover shows a modern photo of the Waikiki Aquarium together with the Humuhumu-nukunuku-a-pua'a or Reef triggerfish (Rhinecanthus rectangulus) at the lower right corner. The back cover explains Hawai'i Post's postage rates. 14. 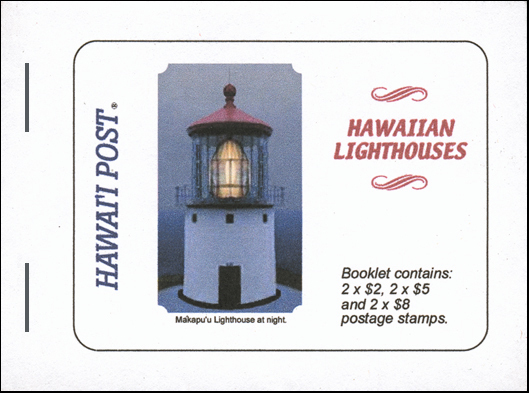 The fourteenth booklet was issued on June 7th 2004 depicting Hawaiian Lighthouses, Part II. The booklet cover is of white card stock and is stapled twice at the left side. 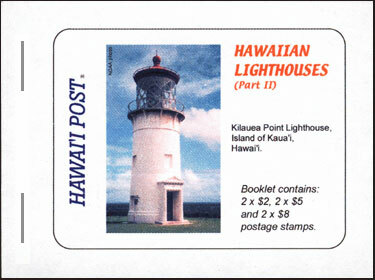 The front cover shows a photo of the Kilauea Point Lighthouse on Kaua'i. The back cover explains Hawai'i Post's postage rates. 15. 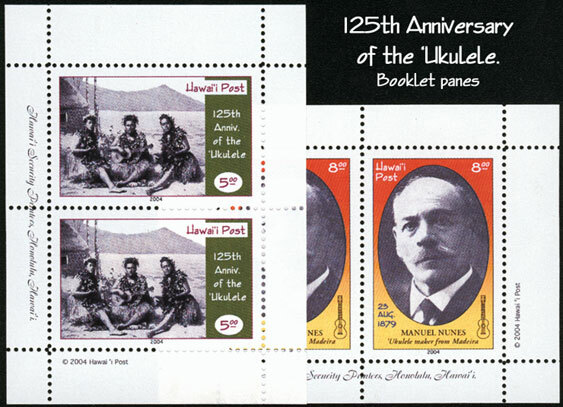 The fifteenth booklet was issued on August 23rd 2004 celebrating the 125th Anniversary of the 'Ukulele. The Booklet consists of 2 panes containing 2 x $5 and 2 x $8 stamps. Each booklet pane consists of 2 stamps and has a white margin all around. "© 2004 Hawai'i Post" is printed vertically on the lower right side margin & Hawai'i Security Printers, Honolulu, Hawai'i. is printed on the bottom margin of each pane. The booklet cover is of white card stock and is stapled twice at the left side. 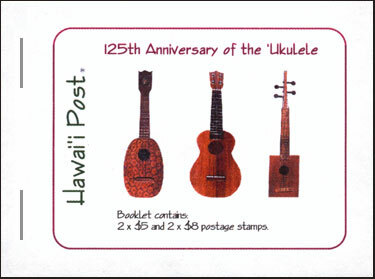 The front cover shows 3 different 'ukuleles. The "pineapple" 'ukulele, a standard 'ukelele and a "cigar box" 'ukulele. The back cover explains Hawai'i Post's postage rates. 16. 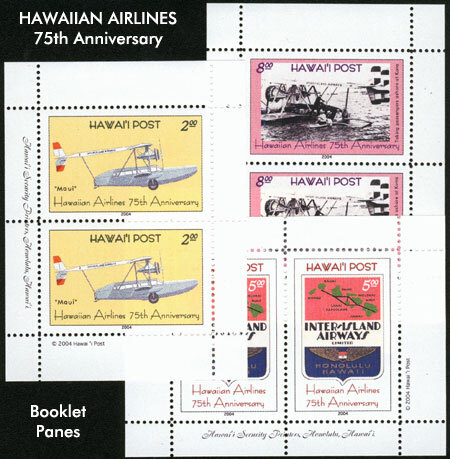 The sixteenth booklet was issued on on November 11th 2004 celebrating the 75th Anniversary of Hawaiian Airlines. The booklet cover is of white card stock and is stapled twice at the left side. 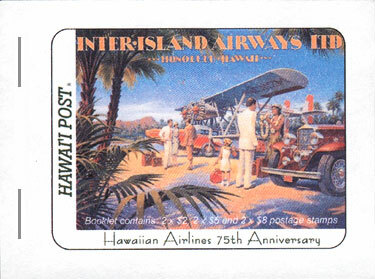 The front cover shows a publicity photo from Inter-Island Airways (the forerunner of Hawaiian Airlines). The back cover explains Hawai'i Post's postage rates. 17. 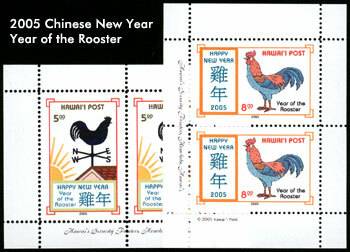 The seventeenth booklet was issued on February 9th 2005 for the Year of the Rooster. The Booklet consists of 2 panes containing 2 x $5 and 2 x $8 stamps. Each booklet pane consists of 2 stamps and has a white margin all around. "© 2005 Hawai'i Post" is printed vertically on the lower right side margin & Hawai'i Security Printers, Honolulu, Hawai'i. is printed on the bottom margin of each pane. The booklet cover is of white card stock and is stapled twice at the left side. 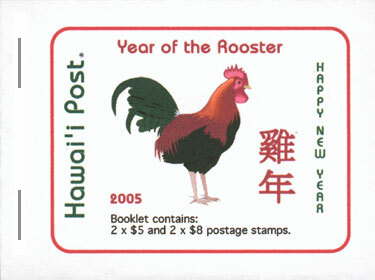 The cover shows a Rooster, with the text "Year of the Rooster" in both English and Chinese. The back cover explains Hawai'i Post's postage rates. 18. 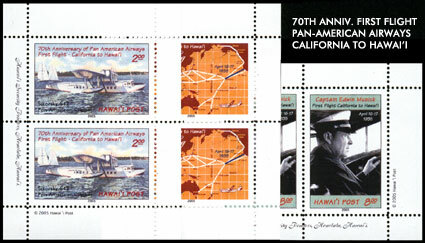 The eighteenth booklet was issued on April 17th 2005 for the 70th Anniversary of the first Pan American Airways flight from Alameda, California to Honolulu, Hawai'i. The Booklet consists of 3 panes containing 2 x $2, 2 x $5 and 2 x $8 stamps. Each booklet pane consists of 2 stamps and has a white margin all around. "© 2005 Hawai'i Post" is printed vertically on the lower right side margin & Hawai'i Security Printers, Honolulu, Hawai'i. is printed on the bottom margin of each pane. The booklet cover is of white card stock and is stapled twice at the left side. 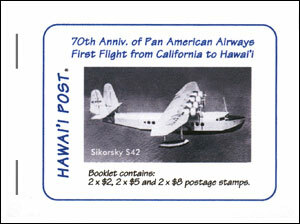 The booklet cover shows a photo of the plane used in the flight, the Sikorsky S42.The back cover explains the postage rates of Hawai'i Post. 19. The nineteenth booklet was issued on July 18th 2005 for the 125th Anniversary of the Kingdom of Hawai'i Bank Notes (Hawaiian Money Part II). 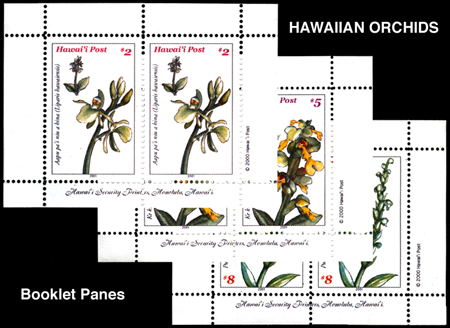 The Booklet consists of 4 imperforate panes containing 2 x $2, 2 x $3, 2 x $5 and 2 x $8 stamps. Each booklet pane consists of 2 stamps and has a white margin all around. The booklet cover is of white card stock and is stapled twice at the left side. 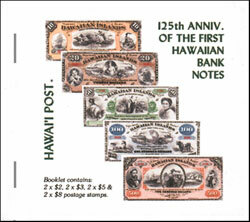 The booklet cover shows the five denominations of banknotes issued by the Kingdom of Hawai'i 125 years ago. 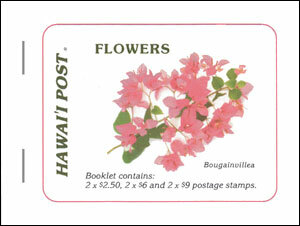 The back cover explains the postage rates of Hawai'i Post. 20. 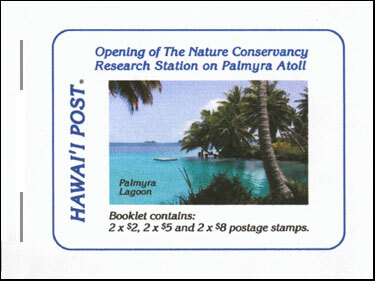 The twentieth booklet was issued on December 1st 2005 for the opening of The Nature Conservancy on Palmyra Atoll. The booklet cover is of white card stock and is stapled twice at the left side. The booklet cover shows a view of the main lagoon at Palmyra. The back cover explains the postage rates of Hawai'i Post. 21. 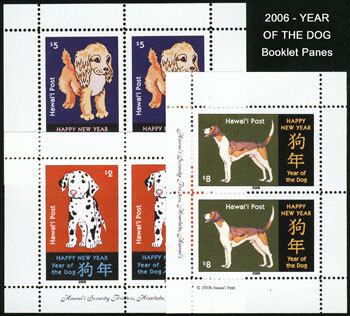 The twenty-first booklet was issued on January 29th 2006 for the Chinese New Year, the Year of the Dog. The Booklet consists of 3 panes containing 2 x $2, 2 x $5 and 2 x $8 stamps. Each booklet pane consists of 2 stamps and has a white margin all around. "© 2006 Hawai'i Post" is printed vertically on the lower right side margin & Hawai'i Security Printers, Honolulu, Hawai'i. is printed on the bottom margin of each pane. The booklet cover is of white card stock and is stapled twice at the left side. 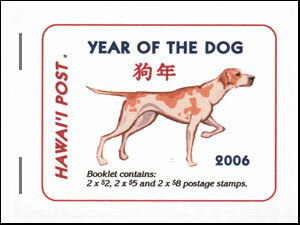 The booklet cover shows a Pointer dog. The back cover explains the postage rates of Hawai'i Post. 22. 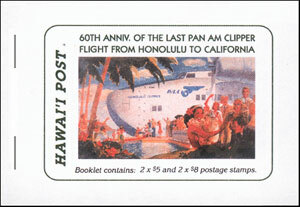 The twenty-second booklet was issued on April 8th 2006 for the 60th Anniversary of the last Pan Am Clipper flight from Honolulu, Hawai'i to California. The Booklet consists of 4 panes containing 2 x $5 and 2 x $8 minisheets. Each booklet pane consists of one minisheet and is imperforate on 3 sides, the left side being perforated 12 (for ease of separation). The Booklet consists of 2 triptych panes each with 1 x $2, 1 x $5 and 1 x $8 stamps. The booklet cover is of white card stock and is stapled twice at the left side. 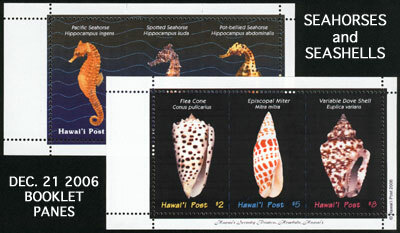 The booklet cover shows the three Seahorses of the November 28th stamp issue and the three Hawaiian Seashells of the December 21st stamp issue. 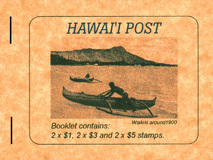 The back cover explains the postage rates of Hawai'i Post. 24. 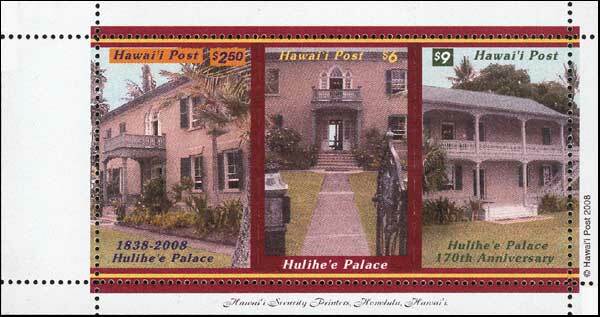 The twenty-fourth booklet was issued on July 3rd 2008 commemorating the 170th Anniversary of Hulihe'e Palace, Kailua-Kona, Hawai'i. The Booklet consists of 2 triptych panes each with 1 x $2.50, 1 x $6 and 1 x $9 stamps. The booklet cover is of white card stock and is stapled twice at the left side. 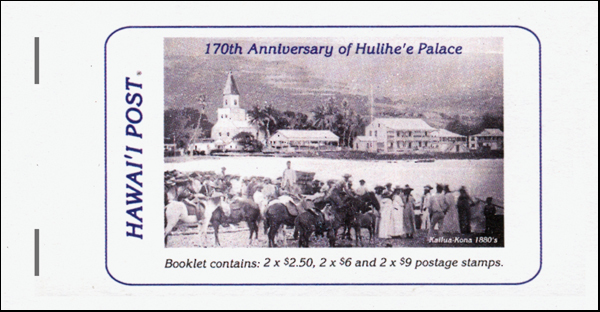 The booklet cover shows a photo take in the 1880's of Kailua-Kona with Hulihe'e Palace in the background. 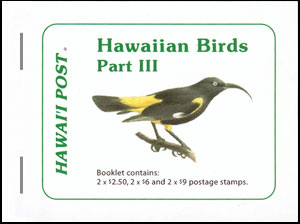 The back cover explains the new postage rates of Hawai'i Post. 25. 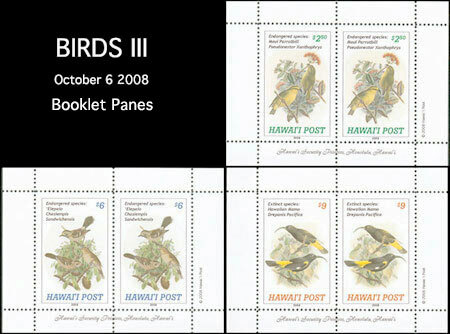 The twenty-fifth booklet was issued on October 6th 2008 depicting the third series of Hawaiian Birds. The Booklet consists of 3 panes containing 2 x $2.50, 2 x $6 and 2 x $9 stamps. Each booklet pane consists of 2 stamps and has a white margin all around. "© 2008 Hawai'i Post" is printed vertically on the lower right side margin & Hawai'i Security Printers, Honolulu, Hawai'i. is printed on the bottom margin of each pane. 26. 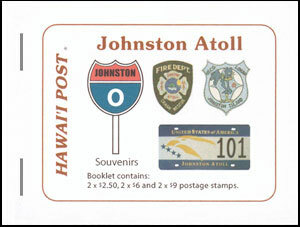 The twenty-sixth booklet was issued on December 2nd 2008 commemorating the 150th Anniversary of the Annexation of Johnston Atoll by the Kingdom of Hawai'i. 27. The twenty-seventh booklet was issued on January 20th 2009 commemorating the inauguration of Barack Obama as President of the United States of America. The Booklet consists of 2 panes containing 1 x $6 stamp and 1 x $9 stamp. Each booklet pane consists of a diptych (2 stamps) and has a white margin all around. "© 2009 Hawai'i Post" is printed vertically on the lower right side margin & Hawai'i Security Printers, Honolulu, Hawai'i. is printed on the bottom margin of each pane. 28. 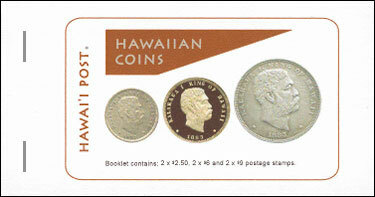 The twenty-eighth booklet was issued on April 8th 2009 and depicts Hawaiian coins. 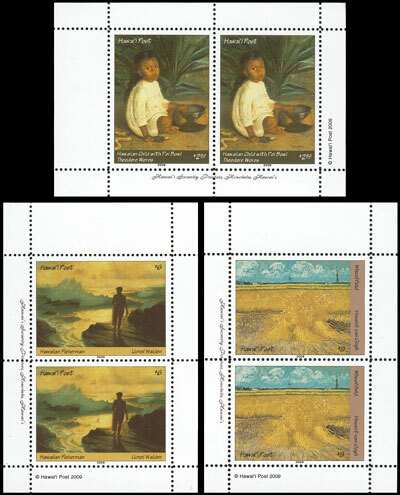 The Booklet consists of 2 panes containing 1 x $2.50 1 x $6 stamp and 1 x $9 stamp each in a triptych. 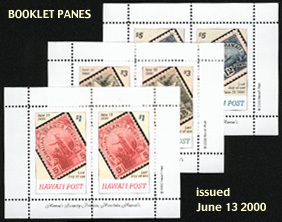 Each booklet pane consists of a triptych (3 stamps) and has a white margin all around. "© 2009 Hawai'i Post" is printed vertically on the lower right side margin & Hawai'i Security Printers, Honolulu, Hawai'i. is printed on the bottom margin of each pane. 29. 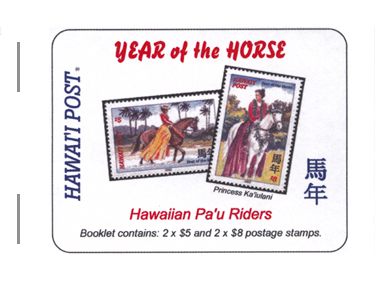 The twenty-ninth booklet was issued on June 4th 2009 and depicts Hawaiian Paintings. The Booklet consists of 3 panes containing 2 x $2.50, 2 x $6 and 2 x $9 stamps. Each booklet pane consists of 2 stamps and has a white margin all around. "© 2009 Hawai'i Post" is printed vertically on the lower right side margin & Hawai'i Security Printers, Honolulu, Hawai'i. is printed on the bottom margin of each pane. 30. 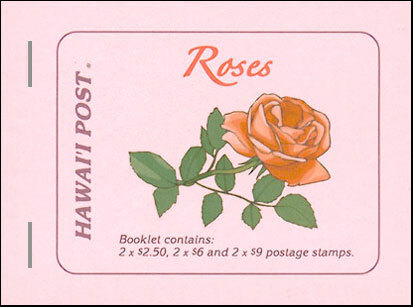 The thirtieth booklet was issued on August 1st 2009 and depicts Roses. 31. 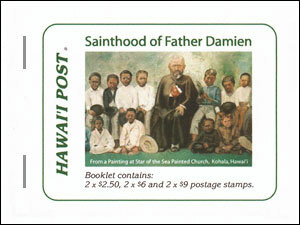 The thirty-first booklet was issued on October 11th 2009 and honors Father Damien. 32. 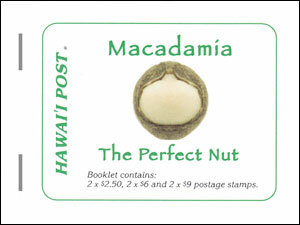 The thirty-second booklet was issued on March 9th 2010 and depicts Macadamia Nuts. The Booklet consists of 3 panes containing 2 x $2.50, 2 x $6 and 2 x $9 stamps. Each booklet pane consists of 2 stamps and has a white margin all around. "© 2010 Hawai'i Post" is printed vertically on the lower right side margin & Hawai'i Security Printers, Honolulu, Hawai'i. is printed on the bottom margin of each pane. The Booklet consists of 2 panes each containing 1 x $2.50, 1 x $6 and 1 x $9 stamps. 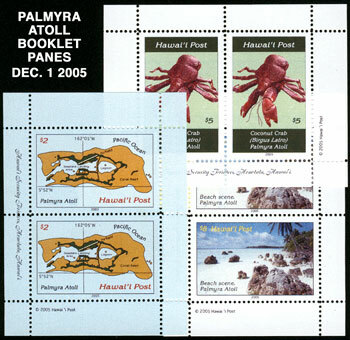 Each booklet pane consists of 3 stamps in atriptych and has a white margin all around. "© 2010 Hawai'i Post" is printed vertically on the lower right side margin & Hawai'i Security Printers, Honolulu, Hawai'i. is printed on the bottom margin of each pane. 34. 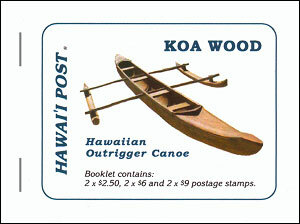 The thirty-fourth booklet was issued on November 1st 2010 and depicts Koa Wood. 35. 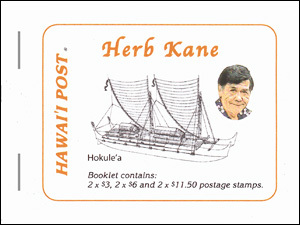 The thirty-fifth booklet was issued on March 8th 2011 and honors Herb Kane. 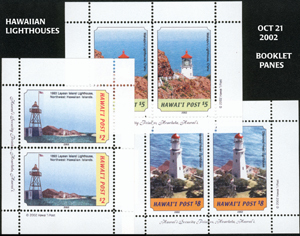 The Booklet consists of 3 panes containing 2 x $3, 2 x $6 and 2 x $11.50 stamps. Each booklet pane consists of 2 stamps and has a white margin all around. "© 2011 Hawai'i Post" is printed vertically on the lower right side margin & Hawai'i Security Printers, Honolulu, Hawai'i. is printed on the bottom margin of each pane. 36. 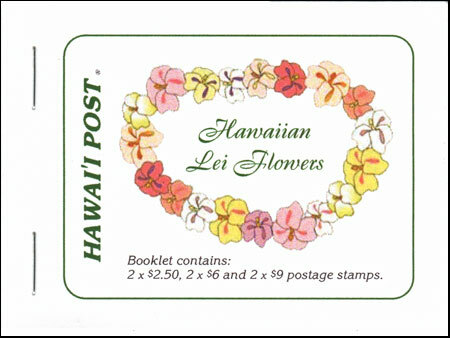 The thirty-sixth booklet was issued on June 21st 2011 and depicts Lei Fowers. The Booklet consists of 3 panes containing 2 x $2.50, 2 x $6 and 2 x $9 stamps. Each booklet pane consists of 2 stamps and has a white margin all around. "© 2011 Hawai'i Post" is printed vertically on the lower right side margin & Hawai'i Security Printers, Honolulu, Hawai'i. is printed on the bottom margin of each pane. 37. 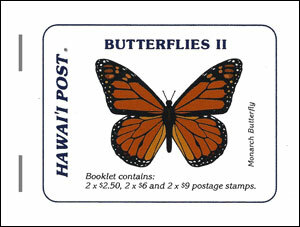 The thirty-seventh booklet was issued on October 14th 2011 and depicts Butterflies II. 38. 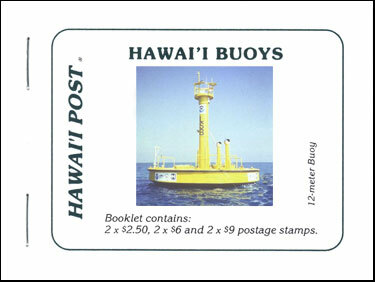 The thirty-eighth booklet was issued on February 16th 2012 and depicts Buoys. The Booklet consists of 3 panes containing 2 x $2.50, 2 x $6 and 2 x $9 stamps. Each booklet pane consists of 2 stamps and has a white margin all around. "© 2012 Hawai'i Post" is printed vertically on the lower right side margin & Hawai'i Security Printers, Honolulu, Hawai'i. is printed on the bottom margin of each pane. 39. 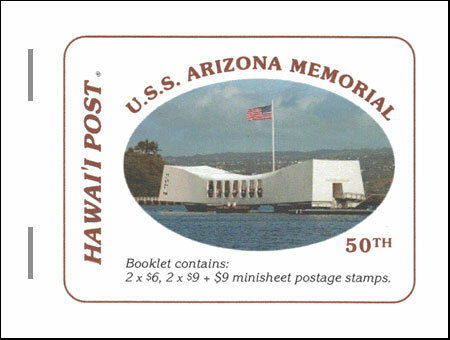 The thirty-ninth booklet was issued on May 30th 2012 and honors the USS Arizona Memorial. 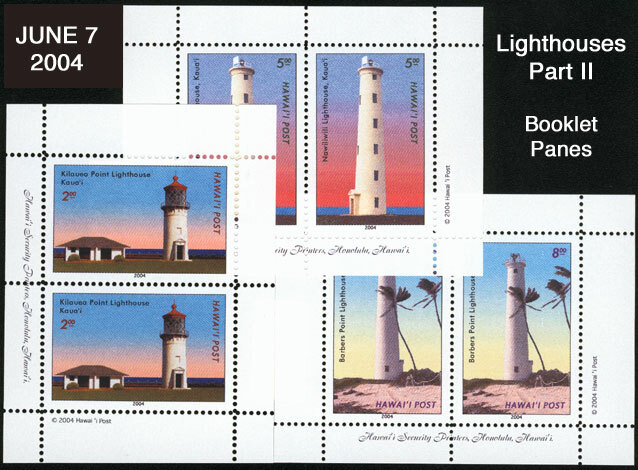 The Booklet consists of 3 panes containing 2 x $6, 2 x $9 stamps and 1 x $9 minisheet. 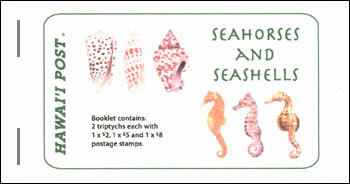 The first two booklet panes consists of 2 stamps each and have a white margin all around.. The third pane is an imperforate (on 3 sides) minisheet, perforated at left (the 4th side) for easy removal. "© 2012 Hawai'i Post" is printed vertically on the lower right side margin & Hawai'i Security Printers, Honolulu, Hawai'i. is printed on the bottom margin of each pane. 40. The fortieth booklet was issued on October 5th 2012 and depicts Insects. 41. 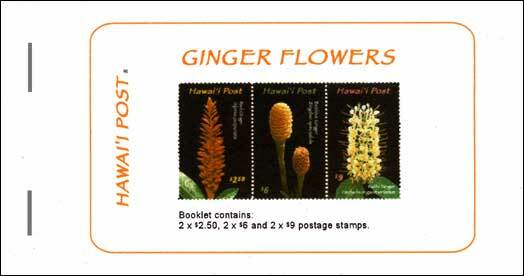 The forty-first booklet was issued on March 5th 2013 and depicts Flowers. The Booklet consists of 3 panes containing 2 x $2.50, 2 x $6 and 2 x $9 stamps. Each booklet pane consists of 2 stamps and has a white margin all around. 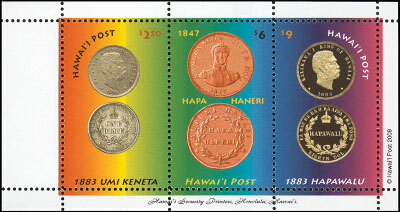 "© 2013 Hawai'i Post" is printed vertically on the lower right side margin & Hawai'i Security Printers, Honolulu, Hawai'i. is printed on the bottom margin of each pane. 42. 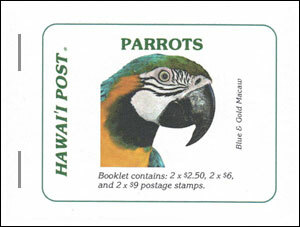 The forty-second booklet was issued on July 6th 2013 and depicts Parrots. 43. 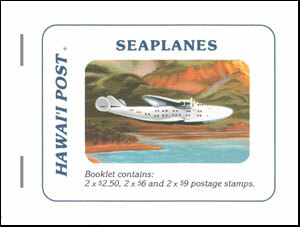 The forty-third booklet was issued on December 9th 2013 and depicts Seaplanes. 44. 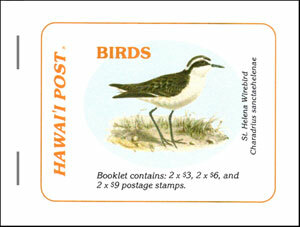 The forty-fourth booklet was issued on March 1st 2014 and depicts Birds. The Booklet consists of 3 panes containing 2 x $2.50, 2 x $6 and 2 x $9 stamps. Each booklet pane consists of 2 stamps and has a white margin all around. "© 2014 Hawai'i Post" is printed vertically on the lower right side margin & Hawai'i Security Printers, Honolulu, Hawai'i. is printed on the bottom margin of each pane.